Nawahi paints Hilo Town, 1868. Painting of the Hilo Town.—We saw the beautiful painting of the town of Hilo of the Kanilehua rain, in the drug store of G. P. Judd [G. P. Kauka] here in Honolulu. The painting was painted by a Hawaiian boy, named Joseph K. Nawahi [Iosepa K. Nawahi], and he used his brush with detail in all the intricacies the painting. When you see it, it is so beautiful, and admiration for that Hawaiian painter wells in the hearts of all who sees it. This youth was not intensely educated in great art schools, but while he attended Lahainaluna Seminary, he was trained in that skill, drawing and painting, and his expertise in that exceptional discipline of the haole is clear for the first time. His name will become famous through his paintings. [We all have heard about the awesome story of the 1888 painting by Nawahi of Hilo Town which was featured on Antique Roadshow, now displayed up on the campus of Kamehameha Schools, but the painting described here seems to be the one in the care of the Mission Houses Museum! 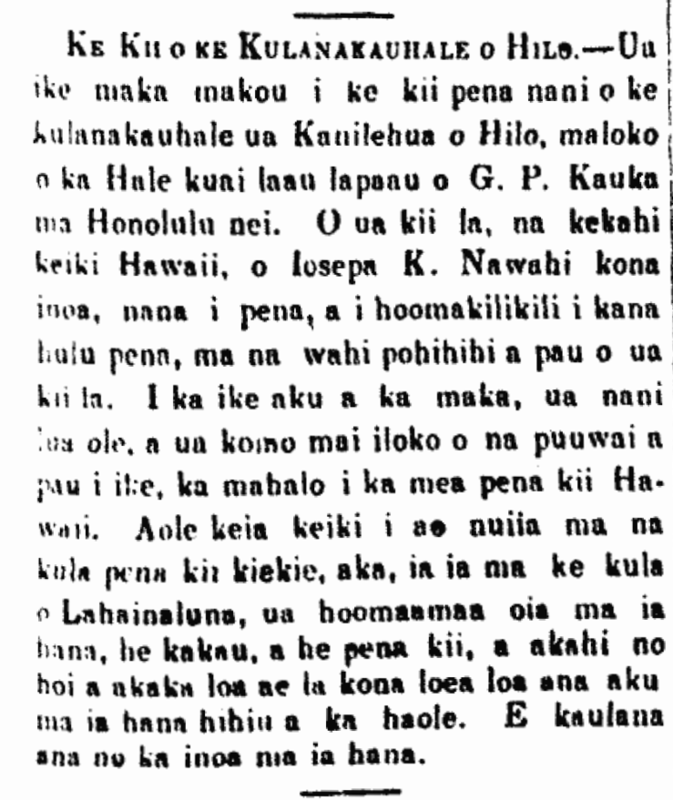 Ka Nupepa Kuokoa, Buke VII, Helu 44, Aoao 3. Okatoba 31, 1868.